ABU DHABI, Jan 15 2013 (IPS) - When Jordan’s Queen Rania Al Abdullah took the podium to address world political and business leaders at a back-to-back energy and water summit here, she said she was representing a country that relies on imports for over 90 percent of its energy needs. Judging by her grim assessment, the energy crisis has apparently hit the Arab world with a vengeance – despite the region’s spreading oil riches. In the Gaza Strip, power cuts are a daily reality, she said. In Yemen, sitting under street lamps to study is simply not an option for girls. And in Sudan, midwives pray that mothers give birth in daylight. And in Iraq, said the Jordanian queen, blackouts are so frequent that the Al-Dakhil Clinic in Baghdad had to destroy precious medicines because they couldn’t be preserved at the right temperatures. But there is light, she promised, well before the end of the tunnel, as Abu Dhabi’s “bold vision for sustainable energy is transforming this nation (the United Arab Emirates) and inspiring our region”. 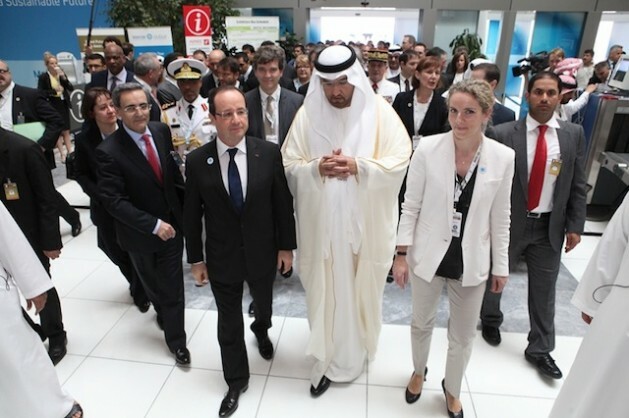 The Jordanian queen was one of the keynote speakers, along with French President Francoise Hollande, who addressed the sixth World Future Energy Summit (WFES) and the first International Water Summit (IWS) taking place Jan. 15-17 in the capital of the United Arab Emirates. Both summits are part of ‘Abu Dhabi Sustainability Week’ which has drawn over 30,000 participants, including political and business leaders, along with some of the world’s most influential experts on energy and water. The two events are hosted by Masdar, described as Abu Dhabi’s multi-faceted renewable energy company. Dr. Sultan Ahmed Al-Jabar, managing director and chief executive officer (CEO) of Masdar, told delegates the leadership in UAE, a nation with the fifth largest proven oil reserves, believes that water is more important than oil. The close relationship between water and energy can no longer be underestimated, he said, pointing out that “no longer can we address water without considering the energy needed to withdraw, treat and transport it”. Roughly seven percent of the world’s energy consumption is used for water and nearly 50 percent of the water withdrawn is used for energy, he added. “This inter-dependency will only grow over time,” Al-Jabar declared. Both summits are also a showcase for some of the world’s leading energy and water companies – including Shell, Canadian Solar, Statoil, the Swedish Energy Agency, Mitsubishi, Emirates Nuclear Energy Corporation and Exxon Mobil – to display their products and spread their technologies to the rest of the world. Asked what has made the most progress in renewable sources of energy, Dr. Damian Miller, chief executive officer (CEO) of the Bangalore-based Orb Energy, told IPS that in terms of percentage, wind has so far made tremendous progress worldwide as a new renewable source of energy as against hydro, which is considered an old renewable source of energy. “But solar energy is growing fast,” said Miller, who has a doctorate from Cambridge University and is the author of ‘Selling Solar’, published in 2009. Asked which country has made the most progress, he singled out Germany. He also identified Bangladesh as one of the countries that has taken a major leap forward in solar energy triggered primarily by increased microfinance lending to this particular sector. According to Stephan Kohler, chief executive of the German Energy Agency (DENA), renewables accounted for 12.5 percent of final energy consumption and 20.3 percent of gross electricity consumption in Germany in 2011. This proportion, he said, is expected to increase to 35 percent by 2020 and to as much as 80 percent by 2050. Dr. Nagi Naganathan, dean of engineering and professor of mechanical engineering at the University of Toledo in the U.S. state of Ohio, told IPS that among the key renewable energy technology candidates (solar, wind, and biofuels), the most progress in the last two years has been in solar with a very large expansion of manufacturing capabilities and a reduction in module prices of more than a factor of two. In many regions solar electric or photovoltaic electricity is now cheaper than the conventional power. Wind is also often cheaper than conventional electricity and installations are rising rapidly, he added. Key technological advances have been achieved in the area of biofuels, particularly with ligno-cellulosic fuels and products to avoid competing with food sources. The University of Toledo researchers have made key contributions in each of these areas, not only with their basic and applied research, but also in technology transfer and commercialisation. Dr. Alvin Compaan, distinguished professor emeritus of physics and astronomy at the same university, told IPS that geographical and societal relevance will continue to play an important role in harnessing the potential of these technologies. Going forward, the biggest challenges are for governments, industry, and universities to work together to develop policies that will best accommodate these new sources of electricity for a cleaner world, he noted. Both wind and solar are intermittent and work best when coupled with energy storage or with the use of conventional electricity generation from natural gas or nuclear sources. “As our transportation becomes increasingly electrified, some of the battery storage on board autos may also be coupled into a “smart grid” in which many different generating sources and many different electricity-using appliances are coupled together to smooth out the fluctuations in electricity generation and electricity demand,” said Compaan. These clean energy issues are exciting challenges for the brightest young minds in every nation of the world, and these challenges and opportunities are really the focus of this WFES Summit, he said. Noble Lies promote the Green Energy Hoax. Global centralized control is limiting local adaptability.